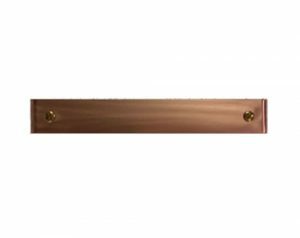 Premium copper screws are now supplied with all Integral Lighting copper faceplates. Our solid copper finish is one of the most popular. Corrosion resistant and suitable for various environments. The copper undergoes a natural oxidization over time, creating a patina and increasing protection against corrosion. Naturally adds value, style and charm to your home’s exterior. The patina also adds a unique beauty to the lighting fixture, distinguishing your home from others. Solid copper is known for its durability. Unlike plastic, copper is not affected by poor weather or prolonged exposure to sunlight. Copper does not become brittle over time and will not rust or rot.